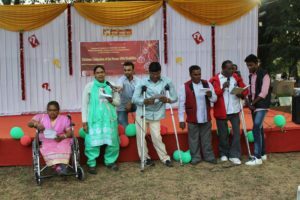 The National Council of Churches in India – Indian Disability Ecumenical Accompaniment organized “Christmas of People with Disabilities” on 1st December 2018 at the NCCI Campus, Civil Lines, Nagpur. This is an annual celebration of the Children with Disabilities celebrating Christmas for others. This celebration is organized on the eve of the Advent (Christmas) Season every year, thereby setting off Christmas Celebrations in the city. This celebration is to remember a child (Jesus) who was born during the cold winter in the wilderness of Judea as a migrant child. His birth heralded glad tidings of great Joy to all creation; the joy of inclusion and social justice – the justice of bringing the wise men and shepherds together. 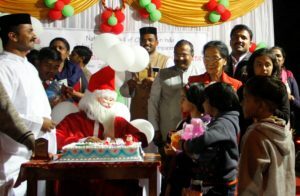 Thus, began the Christmas celebration, in the NCCI campus, with a gathering of over 350 people including over 200 Children and People with Disabilities; it was indeed a grand event. The children with disabilities and the persons with disabilities, who gave expression to the good news of the season, ornamented this celebration. 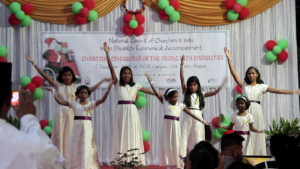 The Children with Disabilities (CWD) in particular, enthralled the audience with their dances, songs and enactments, through which they declared the Gospel of inclusion to the people present at the celebration. ety, Untkhana – Home for the Aged and Disabled, SAKSHAM, CNI – Social Service Institute, Shramdeep, St. Thomas Orthodox Theological Seminary and Talking Hands Restaurant. The Story of Christmas and the message on inclusions were articulated in a manner in which the Children with Disabilities understood it. They showcased an Autistic Joseph, a Down-Syndrome Mary, a Commodified Baby Jesus, and Santa on a Wheel-Chair. This radical yet conventional Christmas message intrigued the hearts of the ‘abled-audience’ who attended the Christmas Extravaganza. At the end of the program the CWDs and PWDs received gifts from the hands of the Santa on wheel-chair. 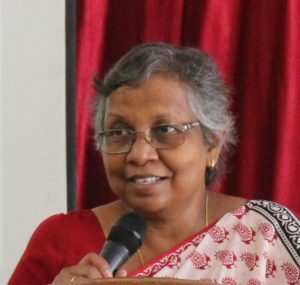 The Indian Disability Ecumenical Accompaniment of the National Council of Churches in India in partnership with the World Council of Churches – Ecumenical Disability Advocates Network, Church of Scotland- World Mission Council, Asia CMS and Christian Service Agency organised an Institute on Disability at the Mission India Theological Seminary Campus, Nagpur on 19 – 22 November 2018. Sixty seven participants from different walks of life including Rights Defenders, Activists, Care-givers, Clerics, Academicians, Researchers, Development Practitioners and Community Leaders representing 37 organisations, including 18 persons with disabilities, participated in this institute. The institute focused on the theme “Walking Together with People with Disabilities: Serving Justice, Peace and Inclusion.” This theme was highlighted from different viewpoints, such as Scanning the Disability Contexts from the societal, legal and medical perspectives as well as from different faith perspectives, pondering on questions such as: “How do religious scriptures address disability? How do the religions look at PWDs ? Are religious worshiping places accessible and inclusive? The Disability concerns were also looked at from the struggles of the marginalized sections of society, through reflections on Caste and Disability, Gender and Disability and Indigenous views on disability. Another session dealt with bio-ethics and socio-spiritual ethics and disability. Further, the institute discussed about the educational, employment and social protection schemes related to PWDs and modern approaches to disability. There were times of sharing of faith stories by the PWDs and their siblings along with a session facilitating the participants to read the scriptures from the eyes and experiences of the PWDs. 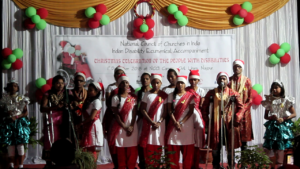 The NCCI – Indian Disability Ecumenical Accompaniment is annually organizing the Christmas Celebration of the People with Disabilities on the eve of Advent Sunday. This year it falls on the 1st December 2018 (Saturday). We would encourage all our constituent members and related stake holders and partners to organise similar programmes. If you are around Nagpur, please join us on 1st December evening. We would happy to have you with family and friends to this celebration and encourage the Children with Disabilities and their parents. 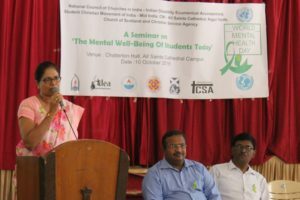 ‘Acceptance is a Gospel Demand and Inclusion is a Gospel Affirmation’ says Mrs. Rachna Singh, Executive Committee member of NCCI, in a commemoration seminar on World Mental Health Day. The United Nations (UN) and the World Health Organisation called the global communities to commemorate and observe the World Mental Health Day on the 10th October every year with the overall objective of raising awareness about mental health issues around the world and mobilizing efforts in support of mental health care. This commemoration provides an opportunity for all stakeholders working on mental health issues to talk about their work, and what more needs to be done to make mental health care a reality for people worldwide. The National Council of Churches in India – Indian Disability Ecumenical Accompaniment and the Church of Scotland (World Mission Council), Student Christian Movement of India (Mid-India Region), Asia CMS, Church of North India – All Saints Cathedral Youth Fellowship and Christian Service Agency organized a Commemoration seminar on Mental Well-being of students in Nagpur at All Saints Cathedral’s Chatterton Hall on October 10, 2018. There were 60 participants from 30 different schools, colleges, institutions, organisations and Churches. This seminar was inaugurated by Mrs. Rachna Singh, the Executive and Finance Committee Member of the National Council of Churches in India. She is also Principal of St. Ursula Girls High School and Junior College, and President of the Young Women Christian Association, Nagpur. Mrs. Rachna Singh challenged and inspired participants to action as she said: Acceptance is a Gospel Demand and Inclusion is a Gospel Affirmation. We, as teachers should have more patience in working with Children who are in need of healthy mental status and environment. There are areas where Children find themselves isolated. In such contexts we need to play the role of a catalyst by way of making the student communities to be inclusive student communities by creating awareness among the students. Also, she invited all school and institutional campuses to become inclusive communities ‘OF’ all and ‘FOR’ all students. This session opened with a word of prayer by Rev. John George, Presbyter of the CNI – All Saints Cathedral, Nagpur. He moderated the seminar. Rev. Christopher Rajkumar, Executive Secretary of NCCI – Unity and Mission, and Director of the NCCI – Indian Disability Ecumenical Accompaniment (NCCI – IDEA) introduced the theme and the context. Ms. Pranita P. Sandela of the CNI – All Saints Cathedral and Mr. Jeswin Rajan, Programme Secretary, Student Christian Movement of India Mid-India Region, jointly welcomed the gathering and honored the speakers and guests of honors. The Seminar had four speakers to speak on four perspectives of the theme: Academic, Clinical, Media and Medical perspectives. Prof. Dr. Dipti Christian, Principal of Hislop College, Nagpur, spoke from the academic perspectives. Dr. Christian invited the attention of the participants by sharing her life and academic interventions of creating mental well-being environment in the institutions she is associated with. She presented tips to identify the students who are under a great stress due to their autism, slow learning, hyper-activity, and colour / vision deficiency, other issues related to vision and the such. She emphasized the need to create space for children to express themselves as they are. She said “We teachers and community workers need to appreciate students who express themselves rather discourage them”. She also invited the teachers to not be judgmental, but rather accept the students as they are, and encourage the other students also to understand each other though encouragement, support and accompaniment. She also proposed a paradigm shift in the present educational system and curriculum in the direction of giving importance to the mental well-being of students rather than importing data alone. Theme: ‘Embracing People with Disabilities: Upholding Their Dignity’. The Indian Disability Ecumenical Accompaniment of National Council of Churches in India (NCCI-IDEA) along with the Church of North India-Nagpur Diocese observed CCA-Asia Sunday on the theme, “Embracing People with Disabilities: Upholding Their Dignity” on 20th May 2018 at All Saints Cathedral, Nagpur. This cathedral, which is more than 100 years old, observed Asia Sunday in solidarity with Persons with Disabilities. This initiative of Christian Conference of Asia (CCA) paved the way to encourage Churches in Asia to renew their commitment towards embracing people with disabilities and to uphold their dignity in accompanying them and mainstreaming their concerns. 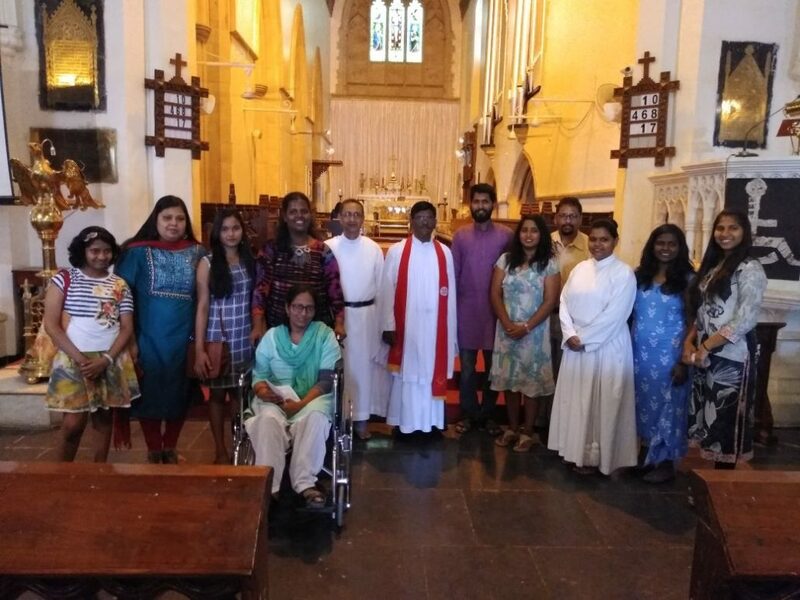 All Saints Cathedral and its premises were done up to create awareness and sensitize the worshippers with posters and wheelchairs, emphasizing that the church should take the initiative to be more disabled-friendly. The Cathedral for the very first time in its more than 100 years of their faith journey witnessed on the occasion of Asia Sunday a preacher with disabilities, Mrs. Cynthia Shinde, Coordinator of NCCI-IDEA, preaching to the congregation and exhorting them to be Disabled-Friendly. The worship was conducted on the Asia Sunday Theme. Rev. John George, Presbyter, welcomed NCCI –IDEA and called on Dr. Rev. Roger Gaikwad, General Secretary of NCCI and President of IDEA to introduce Christian Conference of Asia and the theme of Asia Sunday. He also introduced the ministerial journey of IDEA, the forum of NCCI. Theme: ‘Embracing the Differently Abled and Upholding Their Dignity’. Greetings from the Indian Disability Ecumenical Accompaniment of the National Council of Churches in India! 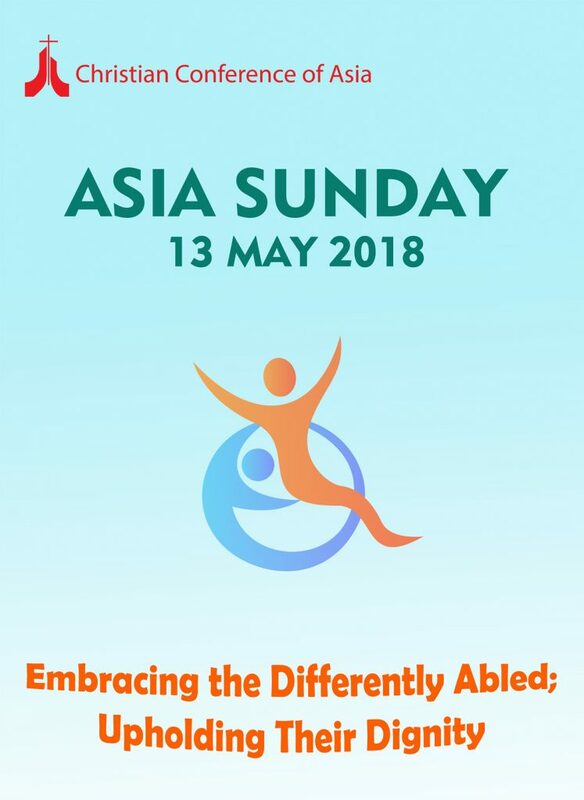 The Christian Conference of Asia (CCA) has invited the entire Asian Churches to observe ‘Asia Sunday’ on 13 May, 2018 on the theme, ‘Embracing the Differently Abled and Upholding Their Dignity’. The Indian Disability Ecumenical Accompaniment of NCCI (NCCI -IDEA) congratulates the CCA Leadership for having chosen the theme concerning The People with Disabilities (PWDs). The Asia Sunday is observed every year on the Sunday before the Pentecost. But, some of the Indian Churches are observing Mother’s Sunday on the 13th May. However, we encourage the Church leaders, clerics and people of God to observe the Asia Sunday either on the 13th May or on subsequent Sundays that are convenient to you. 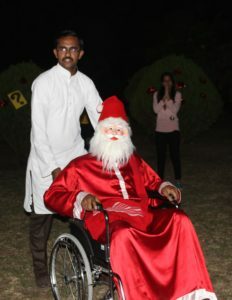 A wheel-chaired Santa graced the Christmas Celebration of the Persons with Disabilities (PWD). This radical imagery of Santa on wheel chair rather than his regular sleigh or dance rung hard in the minds of the participants. 8th December 2017 marked a one of a kind celebration with over 250 people and over 100 persons with disabilities who made it to this historic eventful Christmas celebration. Neither the foggy winter nor the chill wind that brushed the people could move the people present as they joyfully participated in some soul inspiring and mind boggling renditions of the Children with disabilities. The Children enthralled the participants by their thought provoking and energized engagement. 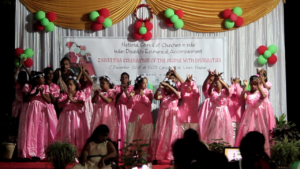 NCCI-IDEA’s 2nd Christmas Celebration of the Persons with Disabilities (PWD) embedded with the core PWD expectations of inclusion, justice, identity and dignity. The children and the persons with disabilities, who came in numbers to spell the good news of the season, ornamented the celebration. Before the children presented their artistic Christmas messages, the people who came there were inquisitive on seeing question marks everywhere. This inquisitivity drew the audience to reflect on what that question marks could mean. Christmas is a time to share the gift of the love of God with the World. Very specifically it is a remembrance of the birth of Christ and its relevance in our context today. Christian communities around the globe are celebrating Christmas, with an expectation of God coming again to the World to realize God’s reign by creating just and inclusive communities, through various creative observances such as visiting, and celebrating with, the socially and religiously excluded communities. 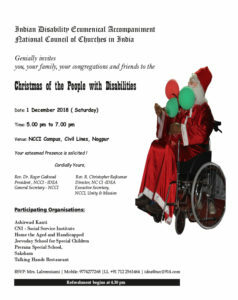 In this context, the NCCI – Indian Disability Ecumenical Accompaniment has started organizing a ‘SPECIAL CHRISTMAS EVENT’ since last year. 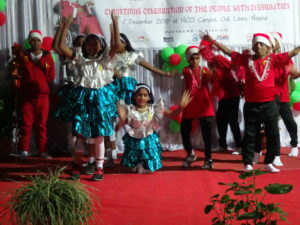 This Christmas Celebration is special because it is celebrated ‘BY’, ‘WITH’ and ‘FOR’ the PERSONS WITH DISABILITIES’. In fact, this is not merely a program that objectifies people with disabilities but makes us to be part of the God’s reign that promotes and affirms ‘Justice and Inclusivity’. The 2nd Christmas Celebration of Persons with Disabilities is scheduled to be held on 8th December 2017 (Friday) at the NCCI Campus, Civil Lines, (near State Bio-Diversity Office), Nagpur – 440001 at 3.30 pm. 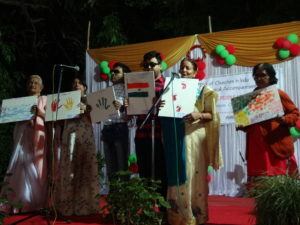 It is a 90 minutes long programme by Children and People with Disabilities. During this auspicious time of festivities, we earnestly solicit your presence in this Christmas of the Persons with Disabilities. Your presence will not only make us glad, but also pass on a message to the society that you stand in solidarity with, and advocate for the Human Dignity and Respect of, Persons with Disabilities, as we journey toward “Just and Inclusive Communities” of God’s people. Therefore, we earnestly welcome each and every one of you to this important celebration. Come… let us share the joy of Christmas, with persons with disabilities, and be reformed. Note: Please share this information with your congregations and related networks. 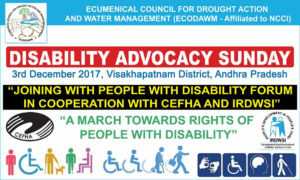 The Ecumenical Council for Drought and Water Management – ECODAWM (NCCI Member) is organizing a Rally in Visakapatnam (AP) on the 3rd Dec 2017. Greetings from the NCCI – IDEA! 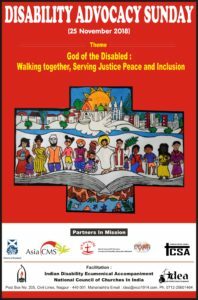 This is for your kind information that, the ‘ Engage Disability’ Network is holding its 2nd National Engage Disability 2017 Conference in Chennai from 14 – 16 November 2017 jointly hosted by the Church of South India Synod. Hence, on behalf of the Engage Disability Team, the NCCI – IDEA would like to invite you and your organization to be part of the 2nd National Engage Disability 2017 conference. Venue: Laity Institute for Transformation Education (LITE), 17, Balfour Road, Chennai 600010. This 2nd National conference builds on the Engage Disability movement which began with the 2014 Engage Disability Conference. This was a watershed moment with nearly 450 people from 100 organisations and churches coming together to strengthen the response to disability in India (declaration attached). This moment turned into a movement. Since 2014 the Engage Disability Network has been working with Christian partners across India to train Christians, produce resources and tool-kits, and meet in the regions to form a Christian response to disability. · To bring together like-minded people and organisations who have a heart for disability. · To develop strategies for ministry alongside those with disabilities in Christian Community. · To equip church leaders for disability inclusion in the Christian Community. · To identify leaders with disabilities who can speak about disability issues in the Christian Community. Sylvia (sylvia@engagedisability.com). They will endeavor to help you as soon as possible.